I accept that I’m a skilled and experienced professional educator. I know what’s best for my students and for my classroom environment. Still, there are times when the prescribed curriculum just isn’t flowing. At that moment, it may not match my personality or teaching style. It may not be working for my students, either. Their vibe tells me they aren’t getting it. These are the times I trust my gut and try something new, something different. When I was a student teacher, my master teacher said I should always be ready to use the “F-word.” That’s “flexibility.” (Don’t go anywhere else!) Being prepared to change the lesson at a moment’s notice is one of the best teaching tools. If the book I’m reading aloud isn’t connecting with the students, we can take a movement break. Or, I can put the book down and we’ll go back to it tomorrow. If the math lesson isn’t going as planned, I can stop and return to the previous lesson, ensuring the students are clearly grasping the concept. Trusting my gut gives me the flexibility to ensure my lessons are successful. When should you stop and trust your gut? Your well-honed teacher’s intuition will tell you when a change of pace is necessary. A lesson that feels forced or sluggish offers the opportunity to use the F-word. Remember, that’s “flexibility.” Give yourself permission to be flexible. It will have a positive impact on your students and help you to grow as an educator. There are times during the day that just… flow. This happens when the pacing is right, everyone is engaged and there’s a gentle buzz of excitement in the room. This is when students might spontaneously burst into a familiar song. Soon, everyone is singing along. These are the moments when I’m most at peace as a teacher. Sometimes they occur when we’re involved in a creative task. Or when we’re working together to solve a tricky math problem. Or using our scientific minds to create a rainbow. These moments might happen when we’re writing stories about a recent field trip or crafting a play based on a favorite book. My goal is to create lots of these moments each day. This feeling of “Classroom Zen” brings joy to everyone. When do your students experience these moments of peaceful flow? Can you create situations to foster them? Perhaps they’ll happen when your students are writing and illustrating a poem about something important to them. They could be triggered by something as simple as counting how many books of different genres you have in your library. When students are engaged with a creative purpose, Classroom Zen just… happens. When creating a piece of art, the artwork consumes me. I feel focused and determined, yet relaxed. I’m tuned-in to challenges and solutions. By giving your students time to draw and doodle, you can give them this same “consumed in art” experience. I use a doodling exercise to teach geometry and shapes. Here’s how it works: When we’re learning about different kinds of triangles, we start by drawing one large triangle on our paper. Then we draw five or six randomly placed triangles inside the big triangle. We continue drawing triangular shapes around the small triangles until our original large triangle is filled with a symphony of triangles and lines. The students can even add color and shading. Once they’ve mastered this exercise, they can “shape doodle” when their other work is complete and time permits. I love seeing how focused and tuned-in they become while simply doodling. When can you give your students time to doodle? Perhaps when you read a favorite story aloud? What about using different kinds of music and observing how this changes their use of line and color? Offer your students time to doodle. Everyone will be energized by their focus and determination. Yet everyone will be relaxed. Another rainy day is approaching, but feel free to insert your own inclement weather here. When the weather shifts, I open my toolbox of techniques to keep the classroom consistent and calm. Flexibility comes first, since a weather change can cause even the best lesson plans to veer off course. So, I like to keep things simple, but with a few tweaks: As the students enter, I play soft classical music and dim the lights. This introduces a sense of calm. I also speak in softer tones, almost a whisper. I encourage the students to cozy up and sit closer to me than usual. I tell my story of a rainy night when I was five years old and how our babysitter put on a show for us. It made us forget all about the storm. The class will begin writing and illustrating a book about our favorite kinds of weather. At the end of the day, to maintain consistency, we’ll sing as many of our favorite songs as time permits. I like to think that everyone can find their silver lining in the cloud when I’m calm. How do you keep things calm and consistent when the weather changes? Do you have a favorite song or story from your past that will relate to the day? Keeping things simple will help everyone weather the storm. I’ve already shared that flamingos are the symbol of Room 12. Have I told you that Freddy Flamingo is our class mascot? Each Wacky Wednesday, there’s mail from Freddy in our flamingo-shaped mailbox. Frida Flamingo, Freddy’s cousin (AKA the puppet on my hand), takes great pleasure in reading Freddy’s weekly rhyming message. Afterwards, we go back and find the rhyming words, snapping our fingers each time we hear a rhyme. Why? Rhyming words are cool! Silly? You betcha! So, let’s talk seriously about silliness. Dr. Suess is my all-time inspiration for both rhyming and silliness. Being silly in the classroom keeps things light and bright (oops, that just slipped out). My students have memorized all my goofy sayings and like to repeat them back to me. I love hearing them tell me I’m being a silly-willy. One way I teach phonemic awareness is by using silly rhymes. Since each table group has a name, like the Green Elephant Table, I’ll tell the Reen Gelephant Fable to line up for lunch. Instead of asking the class to stand up on the floor, we band cup on the door. When the students correct my silly wordplay, I know they’re listening for beginning sounds in words. A little silliness goes a long way in your students’ learning. Seriously. When was the last time you were silly with your students? Do you play with rhymes? Is there a silly song or poem your students can use to transition from one activity to another? Let yourself be silly and help the students join in. You’ll be proud and happy with your big win. I just can’t stop. We began working on our rainbow collages today. “Make sure to fill in the white space,” I reminded them as they began with the red arch. What about white space in a daily lesson plan? I like to use those extra few minutes each day for spontaneous creativity. We can sing a song we love or dance from one place to another. Sometimes, we’ll do drawings about what’s going well at school that day or invent a song about who was particularly kind during lunch or recess. Grabbing the white space during the day is fun. Even better, it helps the students find ways to fill their own white space outside of school. How can you creatively fill the white space in your schedule? Perhaps a call-response chant as you walk to lunch? An energizing dance after a lesson? When you fill the white space with creative activities, you fill your classroom with joy. You’ll love how the students love it. We may think outside the box, but we can teach within the lines. Teachers are always creating lines – from lining up the class to go outside to lining up desks in rows. Lines are found on the playground and in the lunch room. Lines are actually the architecture that forms a school. I like to use an art lesson about lines to teach academic math vocabulary. 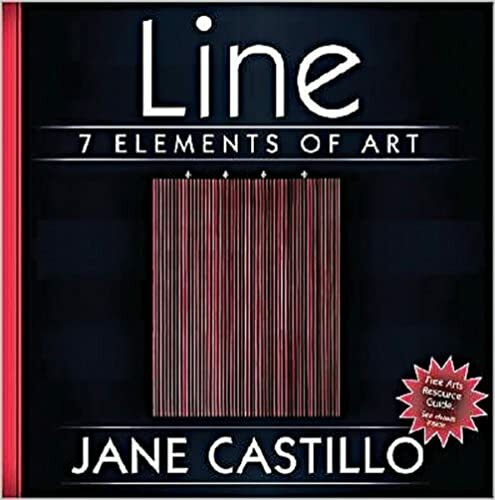 Line: 7 Elements of Art by Jane Castillo is a great resource to introduce the concept of lines. The book uses beautiful photographs to illustrate different kinds of lines in art and nature. As we read the book, we draw different kinds of lines in the air with our arms and hands. We practice drawing various lines on white boards, then we use those lines to draw a picture. On the playground, we follow lines painted on the pavement and discuss if they’re straight, curved, diagonal, horizontal or vertical. It’s logical that the language of line used in art parallels the language of line used in math, science and dance. Reinforce this concept daily. Your students will become adept in making linear designs with their bodies, in their art and through their use of language. What kind of lines will you make with your students today? Referencing a map, can your students use their bodies to show horizontal and vertical lines? Can they walk in a zig-zag line to the cafeteria? Take a line walk around the campus. Let the students draw whatever lines they find. The more you use the vocabulary of line, the more your students will excel with academic language. The path is a straight line!